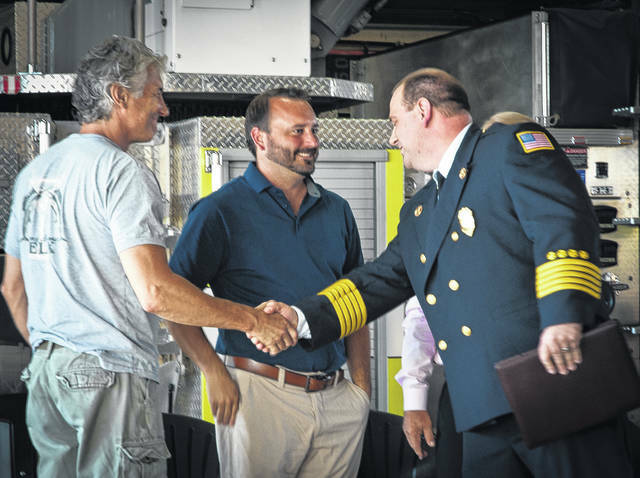 After being sworn in and having his badge pinned to his chest, Fire Chief Christopher Kovach shakes hands with the board members of the Berkshire, Sunbury, Trenton and Galena Fire District. After an 18-month search, Kovach was chosen from several applicants to serve as the district’s new fire chief. Fire Chief Christopher Kovach looks down at his notes for a moment of reflection before his speech as BST&G’s new fire chief. 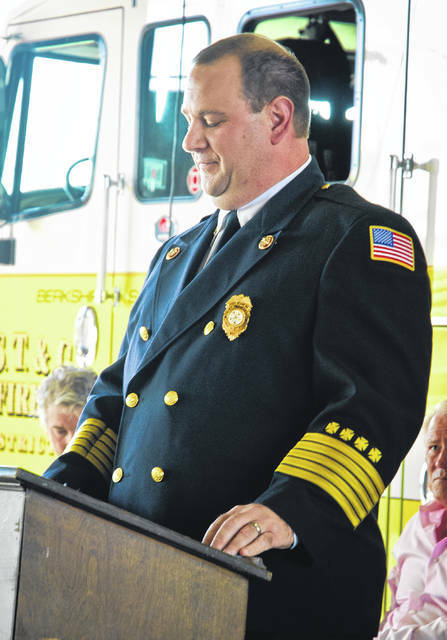 The Berkshire, Sunbury, Trenton and Galena (BST&G) Fire District welcomed Christopher Kovach as its new fire chief during a swearing-in ceremony held July 12. Kovach is replacing former Chief Jeff Wilson, who passed away June 8 after a battle with Glioblastoma, a form of aggressive cancer that he was diagnosed with in January 2017 after an MRI. Wilson underwent surgery for the tumor and returned to his duties as fire chief in March 2017 at first on a limited scale. Wilson, 54, retired from the fire district on Jan. 31 of this year after 30 years of service starting as a volunteer and later serving as fire chief for six years. Kovach was greeted by BST&G board members, Delaware County Prosecutor Carol O’Brien and staff, Delaware County Emergency Medical Service’s Chief Michael Schuiling and Assistant Chief Eric Burgess, Delaware County 911 Director Patrick Brandt, Delaware County Commissioner Jeff Benton, the firefighters of BST&G and the BST&G community. In Kovach’s speech as the district’s new chief, he told the firefighters that he loved old firehouse stories. “Talk about him,” he said to them about their friend and former chief. Kovach said he has been involved in the field for 20 years, 18 years as a full-time firefighter and two years as a part-timer. Kovach said he and his family are moving to the Sunbury area. Kovach added he is moving first into a townhouse that he and his family are renting, and then his wife and children will join him in two weeks just before the start of school year. “We’ll rent for a year and then we’ll figure it out,” he said. Kovach said during the hiring process, he has had some interaction with the BST&G crew for which he said he is excited about. Over the last eight months, Kevin Kline, assistant chief under Wilson, was asked by the BST&G board to be the interim chief during the search for a new chief. Kline said the search for a new chief was conducted by the Ohio Fire Chiefs’ Association. He said he had put his resume in the stack but didn’t get the job. Kline said the association narrowed the search to three candidates for final interviews before the district’s board. However, after the final candidate was chosen, he turned down the board’s offer causing the association to go back to the pool of candidates and chose three more to interview. Kovach was chosen from the second round of three candidates. The BST&G Fire District operates out of a facility located at 350 W. Cherry St., Sunbury, and is dispatched through Delaware County 911. This entry was tagged Berkshire Township, BSTG Fire District, Christopher Kovach, D. Anthony Botkin, Galena, Kevin Kline, Ron Myers, sunbury, Trenton Township. Bookmark the permalink.